What does a 26-foot center console look like after spending about 3-1/2 years drifting around the North Atlantic? Well, these photos of the 26-foot Regulator Queen Bee will give you a pretty good idea. She is in pretty darn good shape, given her 3,000-plus-mile journey across the pond to Spain, during which time there were at least six named hurricanes in the North Atlantic. Click play for a look at the boat after its recovery. Queen Bee was lost in the summer of 2008 off Nantucket, Mass., when a large breaking wave knocked owner Scott Douglas and his brother-in-law, Rich St. Pierre, out of the boat. 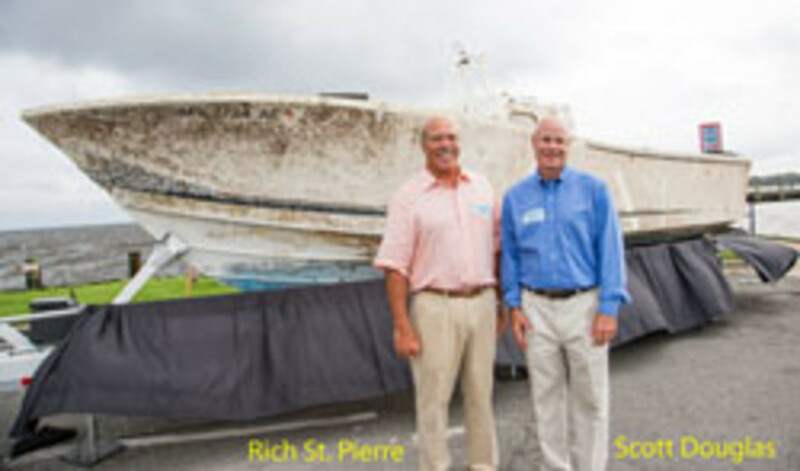 Douglas and St. Pierre were recently reunited with Queen Bee at an event in Edenton, N.C., hosted by Regulator Marine, which arranged to have the boat brought back from Spain, where it was found earlier this year. The boat was found with its twin Yamaha 225s still attached to their bracket, the console intact, the liner in the boat and the T-top frame bent but in place. The batteries were even in their boxes. Click here for Bill Sisson’s column on Queen Bee in the October issue of Soundings.